While walking this morning over the swing bridge that connects Indian Harbour Beach and Merritt Island, we met an interesting man while he was fishing on the bridge. Always curious as to what kind of fish people are catching, we stopped for a look in his bucket. He had some “whiting” and some “spot”. He explained, “Some people fish to eat, some people fish for pleasure, I fish to feed the wood storks.” So he really didn’t care what kind of fish he caught, as the wood storks will eat any kind of fish he is lucky enough to catch. 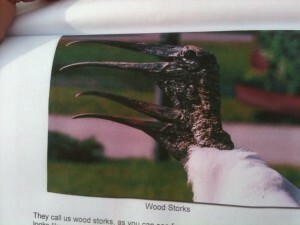 Mr. Miller encouraged us to continue our walk; and he said on our way back, he would show us the book he had written on wood storks. 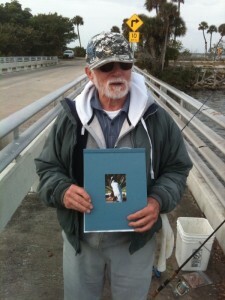 As promised, he had walked to his car to retrieve it and had it with him on the bridge when we returned. His love for this “endangered species” ( according to what I’ve since read) is evident in his gallery of pictures in his handsomely bound book. 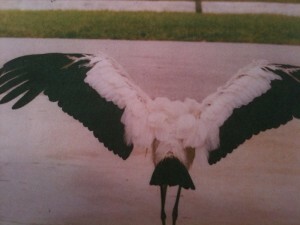 A picture of a picture from Mr. Miller's book showing the Wood Stork's wingspan. 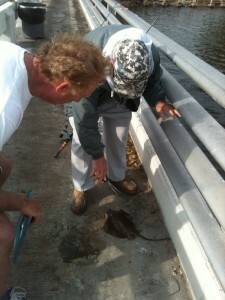 While we were talking with Mr. Miller, he caught a small stingray. He wanted a picture of the barb on the stingray’s tail and he didn’t have a camera with him, so I took this picture and e-mailed it to him, as he plans to write another book and could use the picture. As you might recall the barb on a much larger stingray brought about the demise of the Crocodile Man, Steve Irwin, who used to have his own TV show. 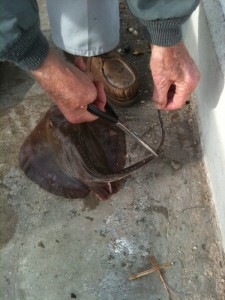 Stingray barb to the right of Mr. Miller's pliers. Gary with Mike Miller and his “catch”.